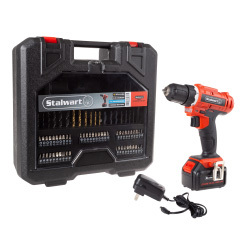 Never be left without the proper tool for the job with the 20V Lithium Cordless Drill and 71 Piece Accessory Set by Stalwart. The accessory set has everything from screwdriver bits to wood and metal drill bits. 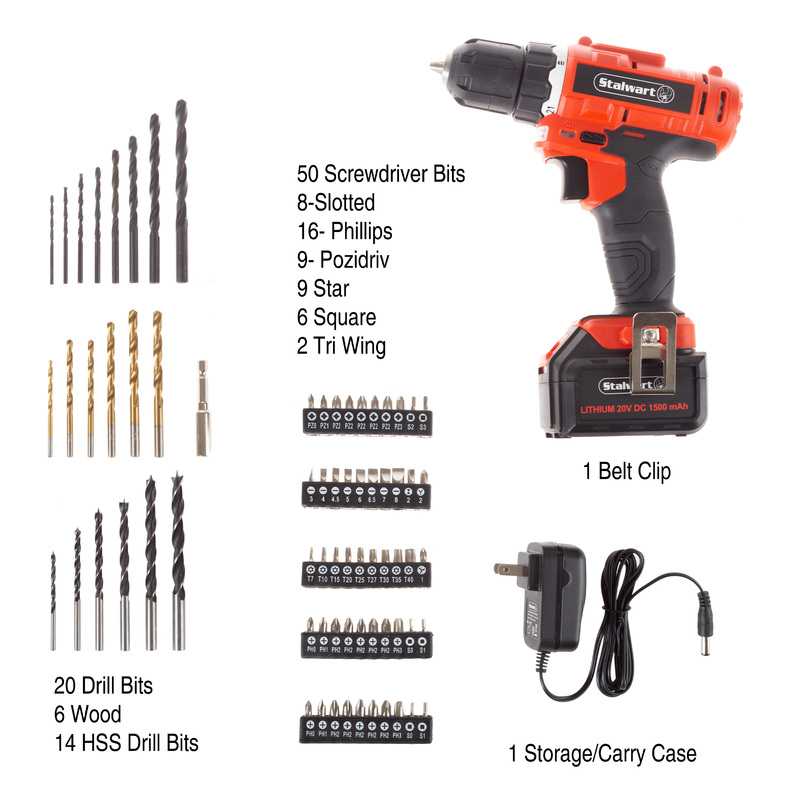 The drill itself is powered by a 20 Volt Lithium Ion battery that gives a longer use time and holds a charge better than Nickel-Cadmium batteries. The battery can hold a charge up to 18 months! The handle is ergonomic and comes with a rubberized coating to enhance comfort and reduce user fatigue. 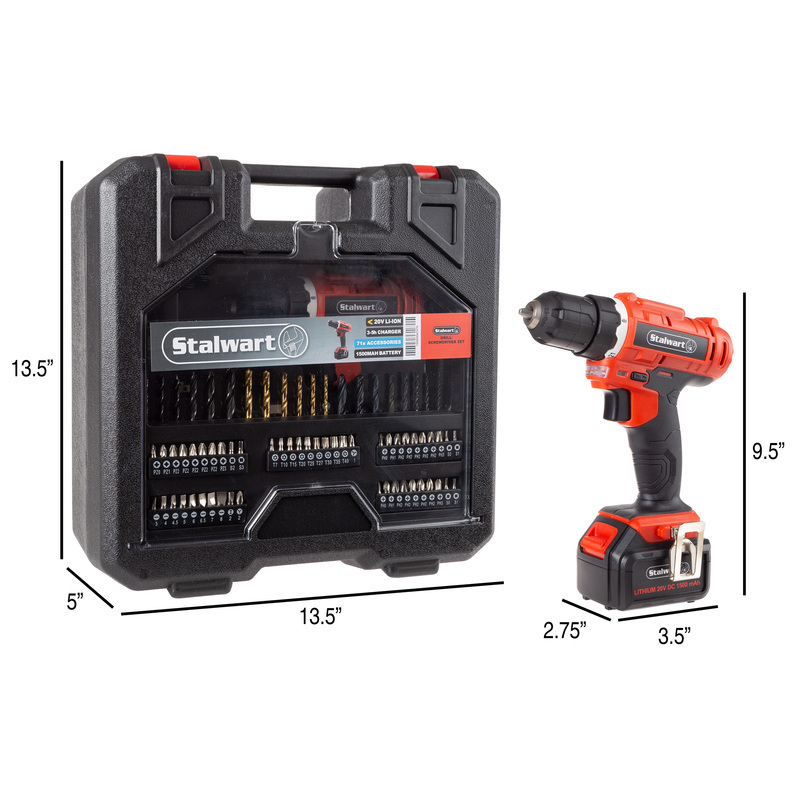 The drill has a 3/8” keyless chuck for fast, convenient bit installation and removal and 21+1 torque settings for precision drilling and driving in any material. The entire kit comes in a hard plastic carrying case to keep the accessories organized and make the kit ideal for travel. The drill comes with a belt clip for easy access while working on ladders or on projects that sometimes require two hands. The built-in LED light turns on when the trigger is pressed, providing extra light in dim areas. The drill has an overload/overheat shut-off feature to keep you safe when the drill is made to work under an excessive load. CARRYING CASE- The entire kit comes in a hard-plastic case with carrying handle. Each driver and bit fits into its own storage slot to keep your toolkit organized and ready to travel with you. It’s great to keep in your truck, RV or garage. 71 PIECE ACCESSORY KIT- Take on any DIY or household project with this extensive accessory kit. It includes standard and specialty screw drivers to wood drill bits and high speed steel bits. LITHIUM ION BATTERY- The included lithium ion battery holds a charge up to 18 months. 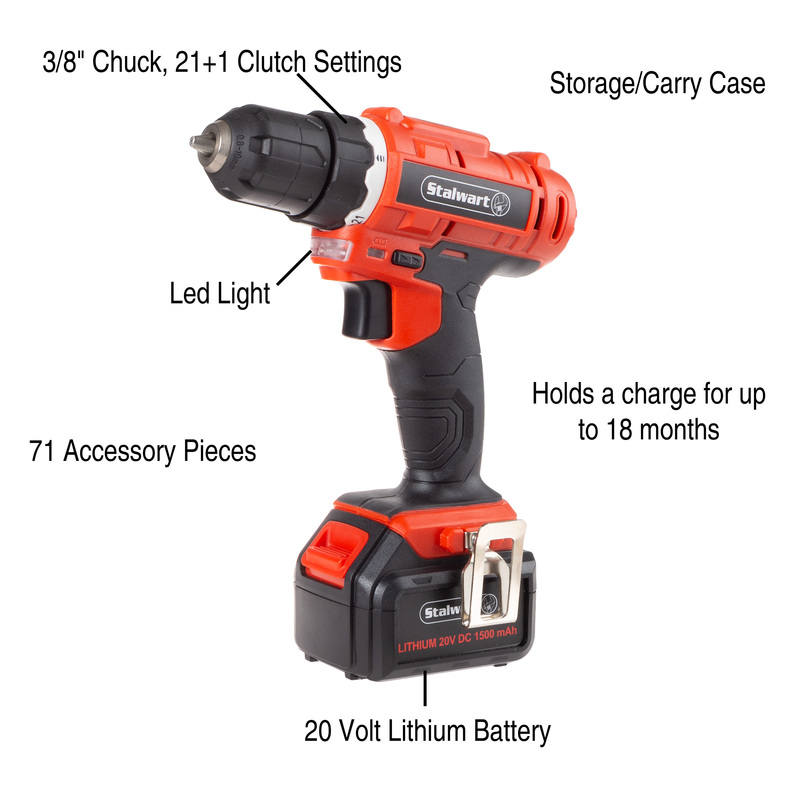 This allows you to have a reliable charge for longer, ensuring your drill won’t die in the middle of a project. PRODUCT DETAILS- Battery: 20 Volt Lithium Ion. 21+1 Torque Settings. Battery Charger: 100-240V, 50-60Hz. Carrying Case Included. 71 Pieces. Color: Black, Red.